Fire dancers from Plaza de Anaya in Tempe are one of the many great things you can see at The Firehouse Gallery in downtown Phoenix. 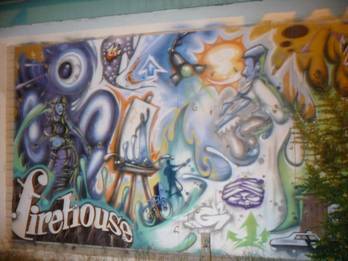 The Firehouse Gallery is located on First Street, just north of Roosevelt Road. Managed by Michael Hudson, it is a mellow artist’s collective with an art space in front and a stage in back. Currently, The Firehouse Gallery is sticking to only doing events on Fridays. In the future, they hope to have the gallery open several days a week. First Friday at The Firehouse are exciting because the fire dancers from Plaza de Anaya in Tempe perform on First Fridays at The Firehouse Gallery. These girls are good; it makes you want to sign up for lessons yourself. And, it’s memorizing to watch people dance with fire. I highly recommend checking out The Firehouse, which is a great example of the sorts of cute little places that make downtown Phoenix unique and special.